As a firearms enthusiast and collector, it’s always a bad idea to simply store your valued weapons under beds or in closets. This provides a safety issue; especially if you have young ones around, and also a firearms collection that features antiques and rare weapons can be valued in the tens, if not hundreds of thousands of dollars. Basically, you should be sure that your collection is stored in a reasonable way to ensure that it can’t be discovered by little ones, and also in a way that it will be protected from thieves or life’s little calamities, and a dedicated gun safe is your best way to do this. To make your search for one of these items easier, we’ve included a section of this write up that’s dedicated to pre-purchase considerations when looking into a gun safe. In addition to this, for your edification, we’ve also pinpointed four great gun safes that will protect your valuable collection. The Mesa Safe Company has been in operation since 1981, and has since become one of the premiere safe brands in the world. Mesa protects private businesses, homes, and personal belongings through a series of fire resistant, well built, and feature rich security products. Our Gold Pick, which is their rifle safe, is one of the most secure products of its kind on the market today, and boasts some great features that are designed to give you a secure state of mind. The first thing you’ll notice about this safe is how sturdily it is built. Clearly designed with rifles in mind, the safe is relatively narrow, yet tall enough to support many of the rifles that are currently on the market. The top of the front door is painted with a gold filigree style that reads, “Mesa Safe Co.”. This feature really harkens back to the safes featured in many western movies of yesteryear. To further this old timey illusion, the device also features a purely decorative brass spoke handle. This is the type of handle that you’d have to turn to access the safe’s insides in bygone days. These nods to the history of safe technology really shines in direct comparison to the high-tech features that this gun safe employs to keep your guns secure. Before we get into these high-tech features, let’s take a look at the devices measurements. As mentioned before, this is a somewhat thin gun safe; its width is only 22 inches, with a depth of 20 inches, and a full height of 59 inches. As is often the case with items of this type, this safe is fairly hefty; it weighs 529 pounds when empty. As these items are rarely designed with portability in mind, you’ll be able to moor the safe to the ground by way of four anchor holes positioned along the bottom of its body. The first security feature that will keep your guns secure is the 12 gauge steel body that will deter any drilling that a burglar might consider. While 12 isn’t as good as a good ten gauge, 12 is still a goodly amount of steel thickness to make cracking your gun safe more difficult. With this level of gauge, the metal for this safe is one and a half inches thick. This layer of protection not only serves as a way to protect your items from the criminal element, but it also provides great impact protection. During tests, this safe has been rated to be able to survive two story falls. The second noteworthy security feature will protect your valuable gun collection from another hazard: fire. Fires are one of the leading causes of lost property in the United States, and typically, it only takes about an hour for you to lose everything. Fortunately, this unit will protect your items from temperatures around 1750 degrees Fahrenheit for a period of up to one hour. As mentioned previously, the brass spoke handle is just for decoration and this safe is actually electronically secured. You’ll have to simply input the entry code into the battery operated locking mechanism. In addition to this, the safe also includes a relocking mechanism that will apply special steel pin-based countermeasures if any thief attempts to drill into its interior. 84 percent of the reviews on Amazon indicate that this is a quality item. These reviews are all of a four or five star level of rating, and the general consensus among these reviewers is that this is a solid safe that has more than enough security for the majority of gun owners. • 14 shotguns or rifles. • Also has removable shelving for the storage of small items or handguns. Steelwater Safes has been in operation for 22 years now and is known for their commitment to creating a strong, secure product that is rigorously tested before it reaches your home. Our Silver Pick product has a great construction and a goodly level of gun storage space. When you compare our Silver Pick to our Gold Pick winner safe, you’ll notice that the two have a very similar form factor. These are both clearly designed with rifle and shotgun storage in mind, and both have an old-timey design aesthetic to them. As a matter of fact, this Steelwater model furthers this classic design by utilizing silver lettering and design notes as well as adding a silver etched pioneer to the base of the door. In addition to these design aspects, there is also a silver framing along the interior of the door that really makes the safe look like a model that you’d expect to see in a bank located in the untamed west. Unlike the Gold Pick, this safe forgoes the brass styling and utilizes a working steel three spoke handle. Once again, this rustic, yet functional design note is a great contrast for a safe that has more than a few 21st century features. When it comes to this safe’s dimensions, it also features a similar size and shape to our previous model; its height is 59 inches, its width is 28 inches, and its depth is about 18 inches. The safe is a little bit lighter though, at a weight of 425 lbs. To ensure proper installation, there are several pre-drilled mounting holes positioned along the bottom of the safe. This will ensure that there will be no tipping hazard for this large unit. When it comes to security, Steelwater has done a lot to keep your guns safe and secure. 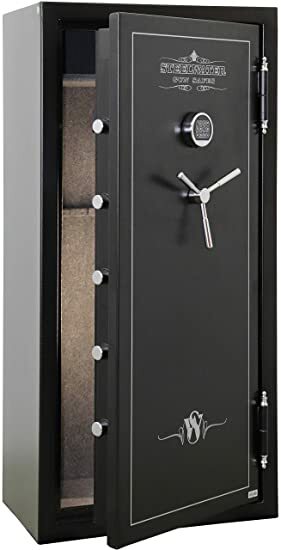 Firstly, this safe employs a 12 gauge steel system to dissuade drilling; as a matter of fact the door to this unit is comprised of 4.75 inch thick steel. To secure this door to the safe’s frame, Steelwater employed 9.1 inch locking bolts that are comprised of solid steel. These bolts insert into the frame and are protected by a relocking system that will employ additional bolts to secure the safe if any drilling is attempted. As alluded to before, Steelwater included a working three spoke lock system to this safe, and with it you can engage the gear driven locking bolt system that adds a extra level of security to this safe. When it comes to temperature resistance, this safe can withstand temperatures of up to 1,550 degrees Fahrenheit for as long as 45 minutes. The electronic lock on this device can also be programmed for a combination of three to eight digits, ensuring great security. 95 percent of the reviews on Amazon are positive for this safe. This is out of a total of 21 reviews, and the majority of these indicate how reliable this safe is for the storage of firearms. Many reviewers note the quality of the Steelwater support and how well-made it is. • 20 shotguns or rifles can be stored in two ten gun areas. • One of the ten gun sections can be modified with shelves to hold smaller items. Our Bronze Pick comes from the first manufacturer on our list who doesn’t almost exclusively specialize in safe creation. Stack-On is a company that produces storage solutions, toolboxes, and work benches in addition to their line of safes. The company has been in operation since 1972 and has become known for its reliable products and unique designs. 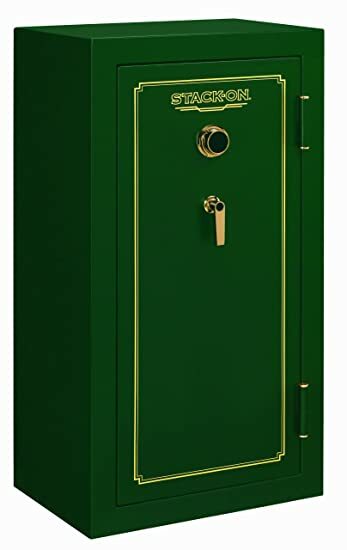 The first thing that is immediately noticeable about this safe is its vivid hunter green coloration. Whereas the previous safes sported a classic aesthetic, this one uses a more modern design that blends gold colored bordering with the Stack-On logo. The functional and decorative spoke handle design of the previous safes is also absent with this model, it simply employs a dial-based locking system and a singular handle for opening the safe’s main door. Overall, this is a reasonably large safe for your firearm storage. Its measurements are 29-1/4 inches in width, 20 inches in depth, and 55 inches in height. While it definitely isn’t quite as high as our other two entries, it has a little more room around the middle than our gold and silver picks; as a result, you can store a few more guns in this safe. Interestingly enough, this doesn’t lend much to its weight, as this safe is the lightest on our list so far; weighing only 415 pounds. This safe is also the first on our list to not employ an electronic lock system. Dial systems of security have been used for more than a century because of their reliability and simplicity and the system that’s used here is very easy to access, and features a drill resistant steel plate that is positioned behind the lock that will protect your valuables should the unimaginable occur. Unfortunately, you won’t be able to change the pre-ordained combination once you purchase your gun safe. Also, the gauge on this safe isn’t very low, but the exterior is drill resistant due to the fact that this safe utilizes a dual layer of steel protection. When it comes to fire protection, this safe will withstand temperatures of 1400 degrees Fahrenheit for about 30 minutes. Most house fires burn up to a temperature of 1300 degrees Fahrenheit, so you should be very well protected with this product. When it comes to reviews, Amazon has a total of 32, and of these 32 reviews, 88 percent are of a four or five star rating level. Most reviews cite the reliability of the dial based system as a reason why this safe shines versus its competitors. • 24 shotguns or rifles can be stored in two twelve gun areas. • One of the twelve gun sections can be modified to feature four removable shelves that you can store smaller guns or valuables on. While this is a listing of gun safes that are under the $1,000 price range, what options do you have if you happen to be ballin’ on a budget? Our Ballin’ Pick, which is the Barska Large Biometric Rifle Safe, is a very unique option that has a very futuristic-seeming locking system. It will securely store your weapons while also making them easy to access should the need arise. Design-wise, this rifle safe is a relatively nondescript item. It’s thin, doesn’t have much in the way of design features, and somewhat resembles a large locker. As a matter of fact, the door has the two identifying characteristics of this device: the handle for opening the door and the biometric fingerprint scanner that you’ll be interfacing with in order to disengage the lock on the safe. When it comes to measurements, this gun safe is 57 Inches in height, 13.75 Inches in depth, and 13.75 Inches in width. This is also, by far, the lightest safe on our list; it only weighs 114 lbs. At this weight it might seem like a good idea to try to install this by yourself, but it’s a good idea to still enlist some help for home placement. The most interesting aspect of this device is certainly its biometric locking system. To enable it, simply open the door and press the red button that is positioned on the inside edge near the hinges. Once pressed, place your finger on the biometric scanner and the device will store your information. The rifle safe can store up to 120 fingerprints, so there’ll be room for storing your spouse’s information into its system. The only drawback to this system is that it’s battery operated, which can cause problems when you have to replace them. While this is not a fire-safe unit, there are still some great security features included with your purchase, including a five point deadbolt system that locks securely. Also, if you find yourself having issues with the biometrics, you can utilize a keyhole that is secreted under some paneling on the front of the device. 67 percent of the reviewers on Amazon have left positive reviews for this product. Most positive reviews cite that the scanner makes this safe one of the most convenient of its type on the market. • Eight to twelve rifles or shotguns. • There are additional storage racks for additional handguns and ammo. • There are also removable storage shelves for additional items. When it comes to locking away your firearms, size will always be a consideration because guns naturally vary in size and shape. Simply put, an AR-15 will take up much more space than your Dessert Eagle .50. Also, as your collection grows, you may need a more spacious safe to accommodate all of your weapons and having numerous gun safes around your property isn’t really a practical option. As a rule, when looking for a new gun safe, the larger size the better. Getting an overlarge safe will grant you storage options for both your larger weapons and additional room for expansion. If you run out of space in your gun safe, you might be left with the unfortunate choice of storing your guns outside of the enclosure, which is unsafe and potentially costly when dealing with potentially opportunistic thieves. Also, remember that your gun safe can be used to store additional valuables, so definitely get one that can accommodate a plethora of different items. Fire is one of the most damaging disasters that can occur in your private life. The sheer loss of lives and personal property as a result of fire in the U.S. alone is staggering. It’s reported that, on average, more than 15,000 deaths are caused annually by fire and about one in six homes are going to be damaged by fire. Your gun collection is not only valuable, but the stored gunpowder in the barrels can exacerbate a fiery situation, so it’s important to do all you can to protect your guns from the high temperatures of a fire by selecting a safe that has high heat tolerances. Typically, a home that’s on fire takes about an hour, under uncontrolled circumstances, to completely degrade and burn out. During this heating period temperatures will vary from 1,100 to 1300 degrees Fahrenheit. Of course, with first responders, the cooling period should be much quicker, and hopefully with firemen on the site, there’ll be much less damage, but most safe manufacturers take the most unfortunate extremes of fire damage into account when they design their devices to be fireproof. Many safes are designed to withstand temperature extremes of over 1300 degrees Fahrenheit for around 45 minutes to an hour. This temperature resistance will ensure that your firearms are protected in this volatile situation. When purchasing a new firearm safe for your valuables, be sure that it has a high level of fireproofing, so that when calamity occurs, your valuables are well-protected. Just like in the movies, drilling is the primary way that unscrupulous individuals will try to utilize to bypass the armor plating of your future gun safe. The truth of the matter is: most low grade safes can easily be defeated by simply using a standard set of power tools. To protect against this, many safes that are worth their salt feature relockers. These relockers will automatically deploy a pin that will safely lock the safe during an attempt at tampering with it through drilling. These pins cannot be retracted without additional hours of drilling, which will give the authorities more time to locate the thieves. The simple fact is that thieves of this type are often caught after they’ve already sold much of what they’ve purloined, so anything that can delay them reaching your valuables will help increase your chance of getting them back again safely. Generally speaking, the thicker the composition of your safe, the harder it will be to tamper with. Safes that are comprised of heavy gauge steel are much harder to cut or drill through than lighter steel that only has a 14 level of gauging. If you want to deter criminals, seek out a safe that has a gauge of at least twelve, that way it will deter thieves who want to steal your valuable firearms. Just remember, the gauging system works in reverse, the lower the gauge level, the thicker the steel will be throughout the safe’s construction. This means that your doors should be at the same level of thickness as the sides and the roof of your gun safe. Mechanical Dial Style – This is the aforementioned method that became popular in heist flicks. This locking system is entirely mechanical and thusly doesn’t need an external or internal power source. You simply spin a dial to enter in a combination and the lock will open when you the right numbers have been input. With this method one million combinations are possible; and as a result, this has been a successful way of keeping valuables safe for 150 years. The primary weakness of this system is the fact that it takes time to open, which can be disadvantageous in a tense situation. Electronic Locking – This incorporates a pushbutton system to open your safe. This is typically a powered system, so you may have to utilize batteries or an external power supply in order to keep this security system active. With this locking system, you can accomplish even more combinations than the dial system; with electronic locking, 1.2 million combinations are possible. The primary weakness of this system is its reliance on powering, though this may be counteracted by the speed in which you can open your safe as compared to the dial system. Biometrics or Fingerprint Scanning – By far the most futuristic option of our choices, this method typically has four or five fingerprint readers that will only open when you place your hand onto them. This method is really great for maintaining security, but similarly to the electronic locking system, it requires power to operate. This is the fastest locking system available, but loved ones will not be able to access the items in the safe if they are under duress when you are not there. Collecting firearms can be a rewarding endeavor that you can take a lot of pride in. Whether you collect as a hobby, are a sportsman, or keep firearms for self defense, you’ll always need a means to keep your weapons safe from a myriad of life’s events. We hope that this list of gun safes provides you with a device that will provide you with years of service and reliability. If these don’t suit your needs, please don’t hesitate to measure any safes that you are looking into against our pre-purchase considerations, you’ll be glad that you did.